Begin by showing all 4 sides of the Block Box, then a solid yellow square block. 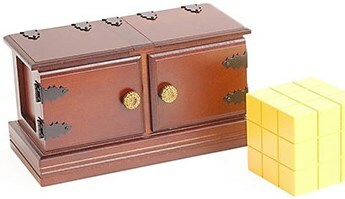 Now put the solid block inside the empty Box, and close the top and front doors. The routine can go on and on! The Block is on the left! Not on the right! You decide to help out the audience and open the doors. This will be easy, they think. Open just one door at a time for even more fun & jokes. Upon opening all 4 doors, the Block has VANISHED! You can produce the vanished Block from a top hat or below the table.